I (Joel) am not Roman Catholic. Josh (the other writer) is…actually a Ukranian Greek Catholic, so it might be odd to see me come to the defense of the Pope (of course, he is in the UK so perhaps he’s able to avoid all the garbage here in the US). Then again, I’m not necessarily defending the Pope as I’m pointing out the contradictions within the (mostly) Republican circles as of late. 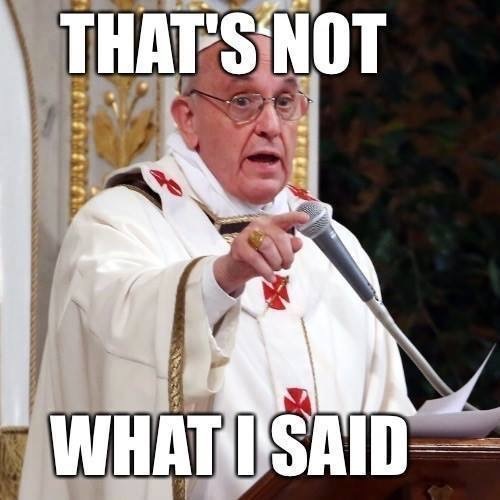 As expected, the Pope’s address to Congress has generated controversy even before it’s occurred. What might shock people is the controversy stems from conservatives, especially conservative Catholics. We’ve been told that abortion and homosexual marriage are perfectly legitimate topics of discussion for the Pope, but economics, climate change, and the like are off limits because “he has no experience.” Of course, he can talk all he wants (according to these conservatives) about abortion or “gay marriage,” regardless of the fact that the Pope has no experience in abortions or being married (or one would hope). Regardless, these conservatives are engaging in a dichotomy foreign to Christianity, separating “faith” from “secular”; they are compartmentalizing the faith, acting as though Christianity’s voice is limited to two or three “secular” topics, but must remain silent after that. Of course, Christianity touches on every aspect of life, but such an acknowledgement admittedly puts one at odds with the current system. After all, how can I love my neighbor if I won’t let him cross my border? How can I pray for my enemies while also celebrating and mocking their demise? How can I care for the poor while also attempting to profit off their poverty? Being a Christian who actually follows the teachings of Christ is never an easy thing, regardless of one’s political leanings. When a libertarian Catholic priest, Rev. Robert Sirico, head of the Acton Institute (you know, the same group that argued for child slave labor in the modern age) argues that the Pope shouldn’t speak on economics because he doesn’t understand it, or when Rep. Paul Gosar boycotts the Pope’s speech in Congress (and Gosar is a Catholic), I think it’s say to say that conservatives have jumped the shark. Whereas they used to argue that they upheld family values and wanted a “Christian nation,” when faced with the prospects of a Christian economy – one that would promote equality and justice and shame avarice – they quickly argue, “Well, a Christian nation in everything except economics.” Whereas liberal Christians might be at fault for allowing too much Marx into their Christianity, conservative Christians are at fault for mixing too much Ayn Rand and Ludwig von Mises into their Christian beliefs. For such people there is a belief that morality has nothing to do with a business or even the environment. The mantra, “A business exists to make a profit,” while simplistic is still taken as Gospel truth for many on the right. To a certain extent it’s not exactly false. After all, a business must make a profit if it hopes to survive, but making a profit is a goal in a business, not the goal in a business. For Christian ethics, absolutely everything boils down to two things: (1) Does this help me love God and, in the same manner, (2) does this help me love my neighbor? Everything in the Christian ethos rests upon those two principles. Even businesses fall under this question, meaning that a business should actually exist to help me love God (via being creative) and help me love my neighbor (by serving him, not exploiting him, not taking advantage of him, etc). Really, all the Pope has argued is that any economic system must be built to help people and not hurt people. The current Capitalistic system does hurt people, so of course he’ll be at odds with it. And at what point in the history of Catholicism has the Church been friendly with Capitalism? Pope Leo III, in the late 1800s, wrote an Rerum Novarum against both Socialism and Capitalism. G.K. Chesterton lamented the practices of Capitalism in the 1920s. Even J.R.R. Tolkien contained implicit condemnations of industrialization and capitalism in Lord of the Rings (and explicit condemnations of both in his private letters). At no point has a major figure from the Catholic Church ever come out in favor of the excesses of Capitalism, mostly because the excesses of Capitalism are in direct contradiction to Christianity. Christianity, at its base, is and always has been about helping the poor, the oppressed, and those without hope. It has always sought justice against the injustice of a fallen world. That the current Pope is doing the same thing ought not surprise anyone. And for those that believe Christianity ought to remain silent on matters of economics or the environment, then ask why we ought to have a voice at all. After all, if the Christian voice is supposed to remain silent when it comes to how the rich treat the poor, why can it suddenly speak up on how a mother treats the unborn? Christianity touches every part of our lives, which will always challenge us and our ideologies, but that’s kind of the point. Posted on September 23, 2015 September 24, 2015 by Joel	This entry was posted in Christians in Culture and tagged Catholicism, Christianity, Conservative, Papal Visit, religious right. Bookmark the permalink.